Our Headquarters has launched a new online shop, www.cpshop.co.uk. CP will receive all of the profits from each sale. The shop has a great range of over 2,000 cat products, ranging from pet foods (such as Felix cat food) and general pet care products to behavioural products (such as the Feliway diffuser), toys, grooming accessories and bedding. You can also buy products for other household pets. You’ll even get 10 per cent off your first purchase and products can be delivered direct to their door anywhere in the UK and some parts of Europe. Each customer’s account is personalised and an automatic product ordering schedule can be put in place for repeat orders. 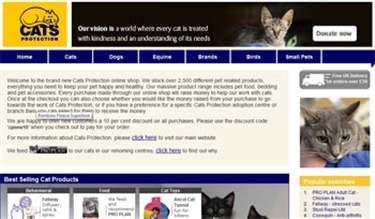 By shopping at www.cpshop.co.uk, you will be helping to support our work, which will enable us to care for even more cats.